My logo picture is me in 2011. (Before my illness ravaged my body.) A friend gifted me with my image in the picture frame being watched by a crowd of witnesses, as Scripture tells us we are. 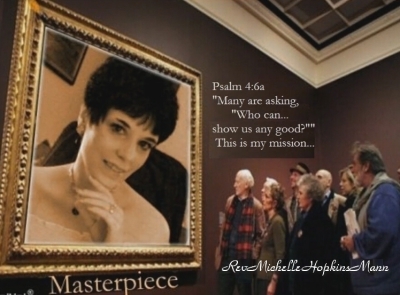 It stands as a reminder to us that we are all Masterpieces in the making, by the Master's hand. And as believers, while many are asking, "Who can show us any good?" If the Lord abides in us, our answer should be, "I can." "Many are asking, "Who can show us anything good?" "Lord, let us see your face smiling on us with favor." "Heavenly Father, God, Creator of all that is... You through Whom all things are held together... Open MY spiritual eyes. Reveal Yourself to ME. Make Yourself so REAL to ME, that there will be no doubt in MY mind, THAT YOU ARE REAL and EXACTLY WHO YOU ARE. If you ARE GOD - bind the enemy so that no lie can corrupt the TRUTH OF YOU TO ME!!!"